Organized, energetic, kind, fun-loving, gregarious, generous, hardworking, perky, engaging, thoughtful are all words used to describe this month’s “Someone You Should Know”, Linda Rudnick. Linda had never played tennis when she joined her school team in 8th grade. By the time she was a senior she was an accomplished player and captain of her team, a testament to her determination and strong leadership skills. Except for the 12 years she took off on a work hiatus she has been an active player and volunteer for 50 years. She served as president of the Women’s Tennis Club of NCC, has captained USTA teams, was secretary for the USTA Delaware District (DD), and volunteered for “Play in May”, “Free Tennis Fridays, and “Tennis in the Streets”. Last year Linda completed a 5-year stint organizing and running JDRF’s Ace for a Cure tennis fundraiser. She easily surpassed her goal of raising money for Type 1 Diabetes research, an organization whose mission is to accelerate life-changing breakthroughs to cure, prevent and treat T1D and its complications. 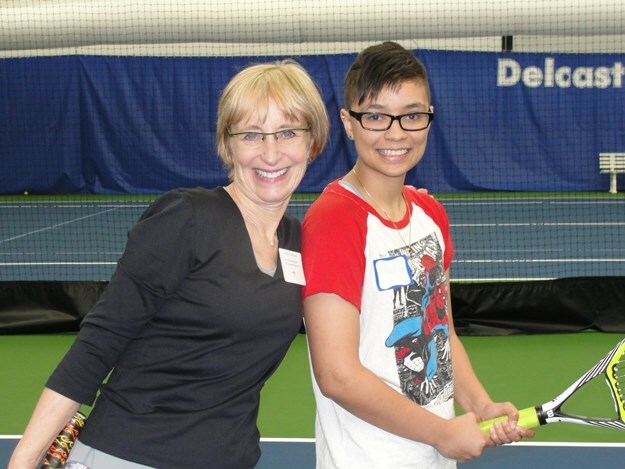 Having attended the JDRF’s tennis round robin tournament I saw first hand how Linda pays attention to every detail to help make the day fun for everyone while raising money for type 1 diabetes, a disease that affects her 60-year-old disabled sister. When Linda isn’t on court you might find her with her partner of 12 years, Dan Tavani, or helping her 85-year-old mother take care of her sister. She is also on the Board of Directors and head of the social committee in her development. And she’s always up for traveling or just hanging out with girlfriends (on or off the court!). We’re fortunate to have Linda Rudnick be a part of our tennis community. Besides being a great player, her enthusiasm, energy and organizational skills are helping to grow the game of tennis!